There is a tale by Oscar Wilde about a sparrow that made a late start going south for the winter and which encountered a magical statue of a prince, resplendent in gold leaf and jewels looking out over the city he had lived. The prince, in the form of the statue, had rather belatedly become compassionate for the poor of the city and persuaded the sparrow to delay his journey and assist in some philanthropic gestures. The bird’s sacrifices were ultimately more than it could survive. I suppose it is a cautionary tale for me. Like the prince I see great need and have put everything I have into dealing with it and trying to get others to help. My wish is that others be spared and that I do not impose upon them beyond what is reasonable. And yet my efforts have been to do just that. It is rather sad. There is another statue. This one is real. Many years ago when I was middle aged I chanced across a catalogue listing ancient treasures for sale. I made some purchases; ah the financial arrogance of middle age. 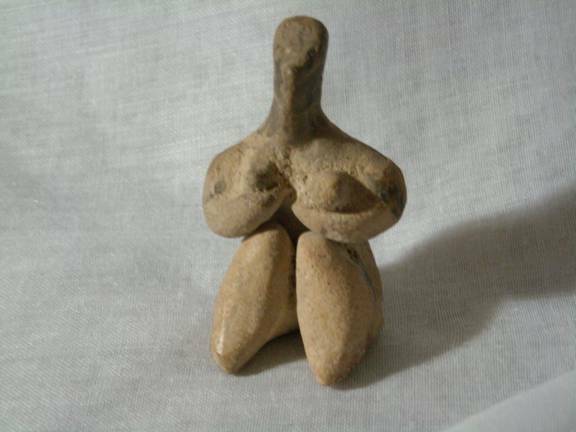 Most notable of them was a ceramic figurine from the ancient lost land of Sumer. She is maybe a couple of inches high, a terra cotta image some five to seven thousand years old, a young woman decorously dressed in bloomers and a full blouse, holding her breasts up with her hands since supporting undergarments had either not yet been invented or had been invented and then forgotten. She has no face, that part being highly abstract, but most of her is quite realistic. So some time thousands of years ago somebody sat or squatted, or maybe stood or leaned, and skillfully rolled out her limbs, painted on the indications of her clothes with slip using a very fine brush, and put her in a kiln to harden. He likely was mass producing the figurines, but any way you look at it he must have had a thousand dollars worth of capital investment and that with his labor probably produced a thousand dollars worth of wealth in a year. If his was the only economic activity in the world at the time, do some arithmetic and figure out the interest rate which would bring the world’s economic output to sixty trillion in seven thousand years. If gross domestic product doubled every seventy years, which would be about one percent per year, then that would mean it should have doubled a hundred times and should now stand at $1,000,000,000,000,000,000,000,000,000,000,000 a year and if there were ten billion people, each should be earning $100,000,000,000,000,000,000,000 from that workshop alone. Economic growth in the long run cannot be as high as one percent, not even close. Pretty as she is, my figurine is a gruesome warning. Civilizations die. We think ours is pretty good. Indeed we seem to have accomplished things never dreamed of. That means we shall die for lack of marrying kin. Had those of Sumer realized that, they could have changed it. Imagine where we would be. When I bought the object I had no interest in fertility. We were all still being told that there were too many babies in the world, that the “population explosion” was by far our greatest danger. There would always be babies. That does not now appear to be the case, but I suspected nothing at the time. I had an inkling perhaps that there was a significant effect of kinship on fertility, but by no means a clue to the fate now stalking us. Instead I bought her because she was something that was old, older than the pyramids, and she had been precious to somebody. Somehow things that are precious for a long time have more appeal to me than things that are valued only briefly. It was not until I had looked up the dates for Sumer and the other civilizations of southern Mesopotamia and graphed them out that I caught the message. So now, like the sparrow, I am flitting about doing tasks for a statue. Were she real, were there a spirit in the clay, and had that spirit an interest in what she was made for, then that it what she would want. There have been 48,701 visitors so far.